Looking for an easy way to put a smile on your kids' faces? Check out our incredible collection of stylish and affordable kids' clothing. Have them looking great all year round! Browse cool jeans and denim for boys and girls that are versatile enough to be worn in and out of the classroom. Comfortable and khakis are another essential that are easy to coordinate with a wide variety of t-shirts, Henley’s, and hoodies. If they're required to follow a dress code, our assortment of professional-looking school uniforms will have them in the top of their class. No matter their style, you'll be able to assemble great-looking outfits that cater towards their unique personalities. Got an up-and-coming athlete? Deck out his or her closet with kids' workout clothes. For the preppy ones, be sure to grab some colorful polos and button-up shirts to complement their slacks and chinos. 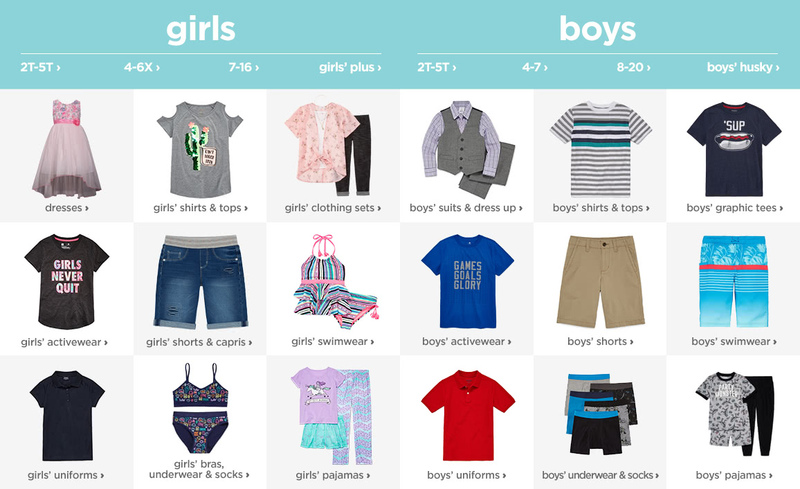 It’s time to get your kids clothes fit for fall! Explore our colorful selection of jackets and coats from the brands you love. Let their personality shine in an array of kids' graphic tees emblazoned with fun phrases, such as ‘Right on Dude’ and ‘Super Adorable.' Speaking of graphic tees, boys and girls will fall in love with our Disney Collection clothes. The collection features all of their favorite characters from classic Disney films such as Toy Story and The Lion King, as well as newer favorites from films such as Frozen and Good Dinosaur. Keep them dressed to impress for every occasion! No matter how formal or informal the occasion may be, you’ll find exactly what they need and want at affordable prices in the kid’s department.